LiveCode LessonsLiveCode LessonsHow To - Step-By-Step Guides To Tasks In LiveCode LiveCode ExtensionsHow Do I Upload an Extension to the Extension Store? This lesson will show you how to register and share extensions on the LiveCode Extensions store. 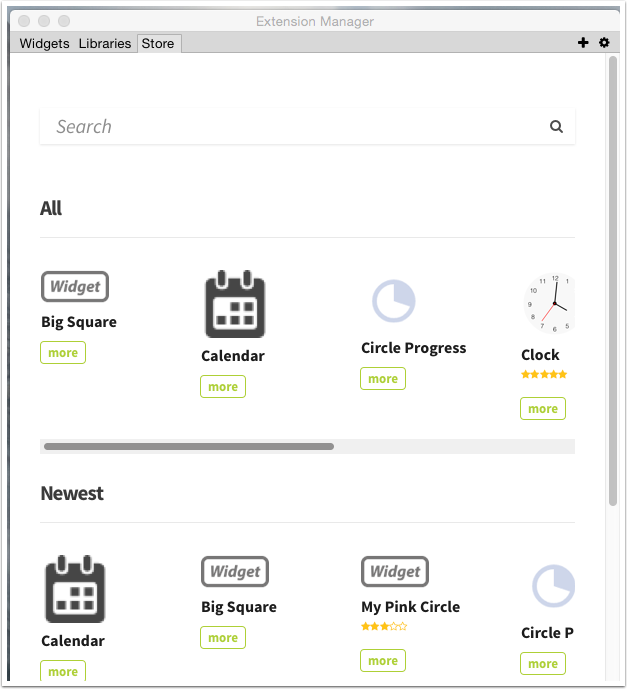 Once you have created your widget or library extension you can make it available to the LiveCode Community via the Extensions Store. The first step is to register as an Extension Developer. Log in to your LiveCode Account and navigate to the the Developer section on the left menu, you will see an option to Register as a developer. LiveCode Extensions must have unique identifiers. These identifiers use reverse domain notation. Choose the Developer ID you want to use here, if your chosen ID is already in use you will be asked to choose a different one. Once you have registered the Developer menu will now show Extensions and allow you to upload extension packages. When you define your extension use your new developer id. My developer is "community.livecode.elanor" so when I define my Calendar widget I define it as below. Only packaged extensions (.lce) can be uploaded to the Extension store so the next step is to package up your extension. 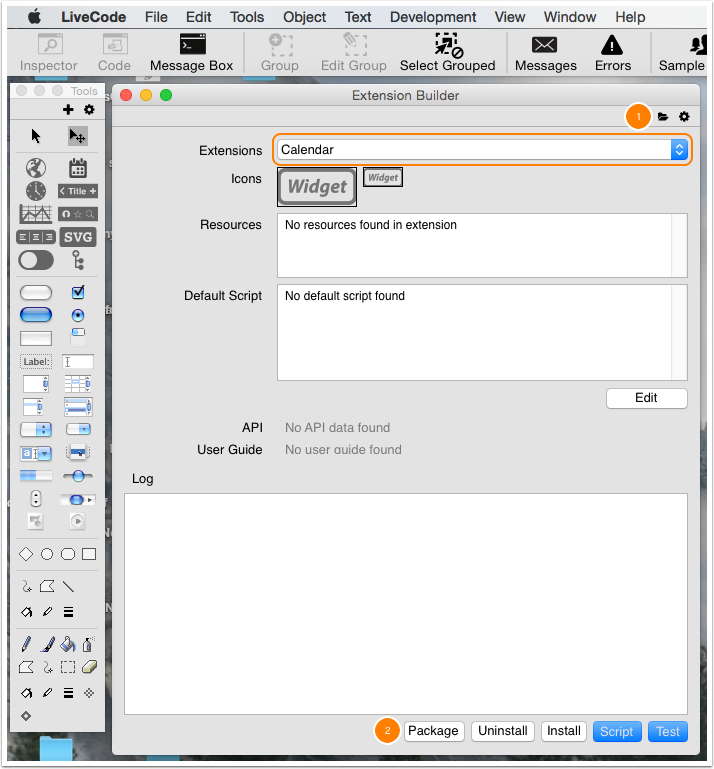 Open the Extension Builder from the Tools menu of LiveCode and select your extension(1). In the example I am using the example Calendar widget from the LiveCode 2016 Conference. Click the "Package" button(2) and choose icons when prompted. When the extension has been packaged you will see a message informing you. The packaged extension will be built in the same folder at the extension source file. Now you have packaged your extension you can upload it to the widget store. Log in to your LiveCode account and select Extensions from the Developer menu on the left. Drag on the extension package you want to upload, when it is uploaded the extension will appear in your list. When an extension is first uploaded it is not active so will not show in the Extension Store. To activate your extension click "activate"(1) under Status, at this stage you will be warned if any information is missing and you can add it by clicking the "Edit" button(2). Once your extension is activated its status wil change to "Active". You can view and downlaod extensions via the Extension Store. To see the extensions that are available to download open the Extension Manager from the LiveCode Tools menu and select the "Store" tab. You will see the recently added Calender widget appears in the store.